Happy Diwali to everyone – we wish that the festival of light brings lots of joy and success in your life. 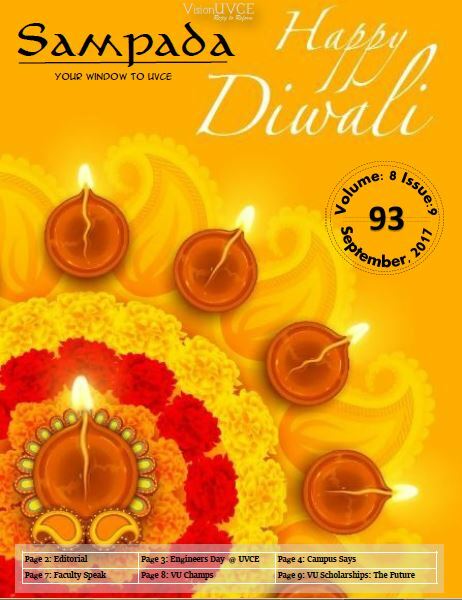 And to celebrate this occasion, Sampada-93 is here.. 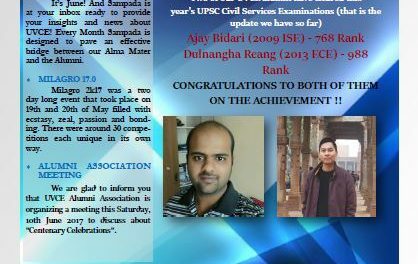 In this edition of Sampada we have details about Engineers Day celebrations in the college, what students think that needs to be improved in the campus on priority, Faculty Speak platform, Announcement of VU Champs for the past 2 quarters, VU Scholarships future plans and many more interesting write-ups. Check to know more about it inside this edition. About the VU Scholarships 2017-18, we have announced the Final List today with a total of 28 Full Scholarships and 44 Half Scholarships. We have got generous contributions from various alumni across the batches. Also, there were suggestions of creating Endowment Plans for various initiatives including Scholarships which will help in the long run. We have a dedicated article about it in this edition asking for your suggestions and views. Please write to us. Also, there is one other thing we are working on – creating a draft proposal for “UVCE – Next 100 Years”. We will share it with the public in next few days and then get an expert committee opinion on how to improve it as well as implement the suggestions. 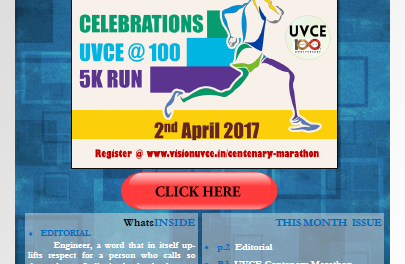 We look forward to hear from you and join hands with us by taking few initiatives to make UVCE a better place. 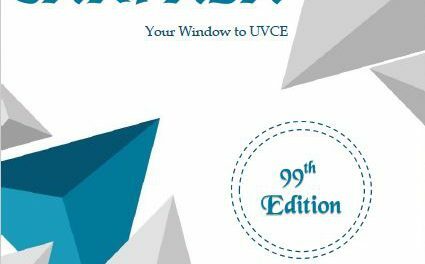 Have you ordered UVCE Centenary Souvenir – Avalokana yet? Get a peak into UVCE’s history by checking this Souvenir. Order Today at www.visionuvce.in/avalokana.